Wang Qishan, who had been No. 6 in the party during Mr Xi's first term, was due to retire from the Politburo Standing Committee under an unwritten rule requiring that anyone 68 or older step down. SINGAPORE — The name of China's powerful anti-graft chief was absent from the Communist Party's new central committee, according to a list published by the official Xinhua News Agency, suggesting that President Xi Jinping is adhering to an informal retirement rule in place since 2002. 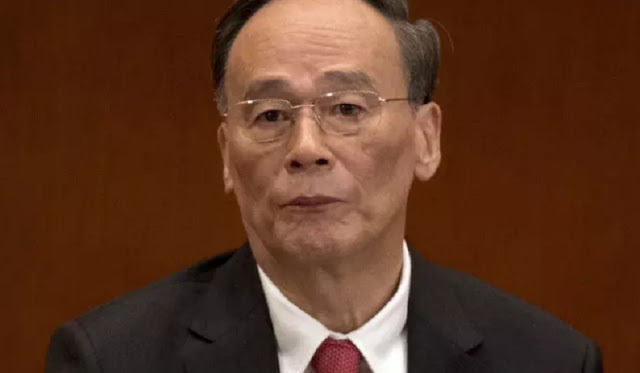 Wang Qishan, who had been No. 6 in the party during Mr Xi's first term, was due to retire from the Politburo Standing Committee under an unwritten rule requiring that anyone 68 or older step down. Analysts were watching to see whether Mr Xi would keep the 69-year-old on China's most powerful body, a move that would boost speculation that he may follow suit in five years. Even so, it remains unclear if Mr Wang — one of China's best known economic reformers and a known Xi confidante — will move into a different role that allows him to retain influence. Mr Wang heads the Central Commission for Discipline Inspection, which punished more than 1.5 million officials in the past five years as Mr Xi has cracked down on corruption. Chinese Vice-President Li Yuanchao, who is 66 and has not reached retirement age, is also absent from the Central Committee list. This means he will be stepping down from the Politburo. China's announcement of a new Central Committee — a body of roughly 200 people — comes a day before the party unveils its top leaders on the Politburo and its supreme Standing Committee. The composition of the new leadership at China's twice-a-decade transition of power may determine the pace of Mr Xi's reform plans, from deleveraging to modernising the military. The name of China's powerful anti-graft chief was absent from the Communist Party's new central committee, according to a list published by the official Xinhua News Agency, suggesting that President Xi Jinping is adhering to an informal retirement rule in place since 2002.